Double-print stripes and leaves make this top special. • Length: PM 24" M 26"
This top has a beautiful design, as usual in a lightweight cotton. The neckline was lower then I like, so I did return it. Relaxed fit. But if you like a scoop neckline it will be perfect for you. The fabric is pretty and good quality. The creative touch of embroidery makes this a unique and lovely summer top. Bring on summer! 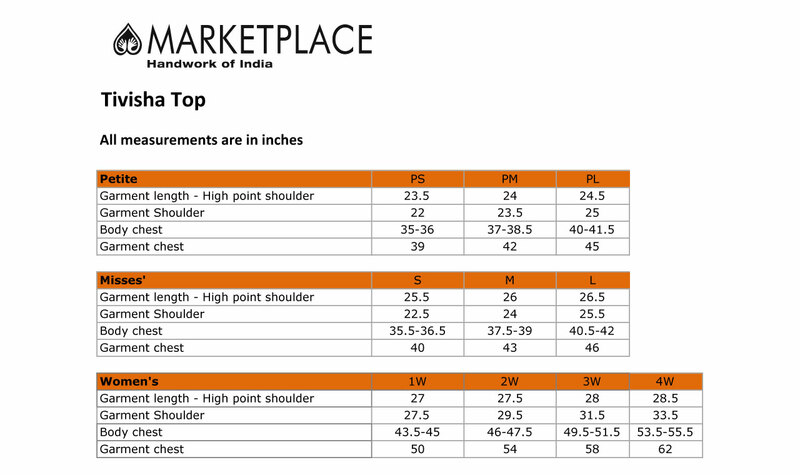 This top was part of my first order with Marketplace India. I was happy to find a place with cute, unique clothing in natural fabrics that come in some plus sizes. I placed a small order to see if they fit and quality are good. I am glad to say they are! I wear a 1X, and these clothes are true to size. The quality is good, the shirt washed up nice. I'm very pleased and will order again. Perfect fit for my body . Love the design and color of the fabric. The sewing is impeccable and well made. Love how the seam is finished. The touch of embroidery adds to the allure of this shirt. I got an early start on summer clothes when this top arrived last week! The fabric is, as always, wonderful. I love the Marketplace bright colors and designs. I have not worn or washed it yet as we still have winter weather in Seattle, but having tried it on the fit seems good and I trust it will remain true to size when washed in cold and hung dry. The only thing I would change would be to have it either be sleeveless or to have a bit longer of a sleeve, but this is not enough of a problem to avoid wearing a shirt that I love. This is a lovely top with beautiful color printed on an nice light-weight fabric. A perfect summer topper!